Operating in the 8, 13, 18 and 23 GHz frequency bands, the DMC W-Series microwave digital radios are a high performance microwave solution for point-to-point DS3 (44.736 Mbit/s) applications of common carriers, cellular network operators, corporate networks and government networks. The W-Series consists of an indoor modem unit and an RF unit that can be mounted either indoors or outdoors. 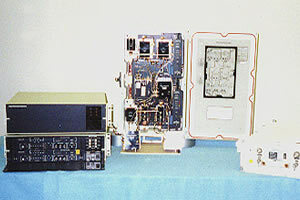 The modem unit, which contains the digital signal processing circuitry, interfaces with the DS3 terminal equipment. The RF unit typically mounts directly behind the antenna to minimize transmission line losses. These radios can be equipped as non-protected or MHSB-protected for critical applications.